The general terms and conditions of Fladderak Industriële VerpakkingenB.V.,having its registered office in Rotterdam, have been registered at the court registry of the DistrictCourt of Rotterdam on 24th of March 2016under number 15/2016. In these general terms and conditions,Fladderak Industriële VerpakkingenB.V. shall be referred to as:“Fladderak”,and its contracting party to the agreement(regardless of the qualification of the agreement)as:“the client”. These general terms and conditions are applicable to all offers and quotations made and all agreements entered into by Fladderak and to the legal and factual acts performed for the implementation thereof. Deviations from these terms and conditions shall only be valid if and insofar as confirmed by Fladderak before hand in writing. The applicability of the general terms and conditions of the client is explicitly precluded. Entering -upon request -into the required insurance agreements. 2. Before entering into an agreement with the client,Fladderak shall clearly indicate what it is committed to,and in what capacity it shall perform its work. These general terms and conditions consist of an introductory chapter,a general chapter and three chapters focused on a number of specific activities of Fladderak, notably “production and sales of packaging”, “storage”and “forwarding”. The general provisions of chapter2 are applicable to all (legal) acts of Fladderak, unless stated otherwise in the specific chapters of these general terms and conditions, in which case the provisions of the specific chapters shall prevail. All offers and quotations of Fladderak addressed to the client individually are entirely non-binding, unless explicitly and unambiguously stated otherwise in the quotation itself. An order given to Fladderak shall qualify as an offer that cannot be deemed accepted by Fladderak until written confirmation by Fladderak. If a quotation contains a non-binding offer and it is accepted, Fladderak shall be entitled to withdraw the offer within two working days after receipt of the acceptance. The following items form part of quotations made by Fladderak: designs, prototypes, drawings, models, calculations, samples, descriptions, images, dimensions, tools, software, et cetera, as well as any annexes and documents referring to the quotation of Fladderak. The items set forth in this paragraph 4 shall remain the property of Fladderak, shall be returned at first request of Fladderak,and cannot be used, copied or made available to third parties without the explicit written consent of Fladderak. Fladderak also reserves all and any existing rights by virtue of intellectual and industrial property. If the client makes any changes to the quotation originally issued by Fladderak, such original offer shall lapse unless Fladderak explicitly accepts the changes made by the client. An agreement is concluded once Fladderak accepts a written order given by the client to Fladderak. An agreement shall furthermore be concluded by the client’s acceptance of Fladderak’s quotation. An agreement shall also be deemed concluded at the moment when Fladderak actually implements the client assignment or order and the client does not immediately protest against such implementation. The quotation sent by Fladderak to the client shall be deemed to completely and accurately reflect the contents of the concluded agreement. The agreement shall be entered into for a definite term, unless it follows from the nature or the scope of the granted client assignment that it has been entered into indefinitely. All verbal client assignments or orders shall be carried out in accordance with the notes made by Fladderak and the interpretation given thereto. The client shall be authorized to provide proof of the contrary any time. All prices quoted by Fladderak are in Euro, exclusive of VAT and other levies / taxes imposed(by the authorities),and are focused on the situation“as is”at the time of such quote. In the event of a later increase of any cost/price factors(purchase prices, costs of labour, taxation, social security contributions, freight costs,costs of insurance (if any), change of exchange rates, et cetera),Fladderak shall be entitled to adjust the quoted or agreed prices accordingly and with retrospective effect. Such price adjustment shall not entitle the client to dissolve the agreement. Unless agreed otherwise in writing, the method of packing and shipment shall be determined by Fladderak. Unless agreed otherwise in writing, packaging shall not be taken back by Fladderak. Fladderak shall not take out any insurance for the benefit of the client for the goods subject to an agreement between Fladderak and the client, unless explicitly agreed otherwise in writing. Apart from the fact that Fladderak is at all times entitled to turn down an insurance request, the ultimate acceptance or refusal of the insurance entitlement shall rest with the insurer concerned. Fladderak is entitled,before starting with the implementation of the client assignment concerned, as well as in any stage of the work thereafter,to demand adequate security of the client for fulfilment of its obligations. Until the client has furnished the requested security, Fladderak shall be entitled to suspend its performance, this without prejudice to the regulations concerning suspension and dissolution of the agreement resulting from the law and from these terms and conditions. Payment shall be effected by wire transfer within 30 days of the invoice date, unless agreed otherwise in writing. For lack of payment within this term,the client shall be in default without requiring any notice of default,and Fladderak shall claim damages consisting of the statutory(commercial) interest on the invoiced amount or the unpaid part thereof, without prejudice to the further rights concerned falling to Fladderak. All collection expenses to be incurred by Fladderak (both in and out of court) shall be borne by the client. The extrajudicial expenses amount to at least15%of the invoiced amount,with a minimum of € 40. The client is not authorized to suspend, with hold and/or set off any amount pay able to Fladderak. Fladderak is entitled to individual invoicing of partial deliveries. Payments made by the client shall at all times serve as payment of all payable interest and expenses first and subsequently as payment of the longest outstanding invoices that are immediately payable, even if the client specifies that the payment refers to a later invoice. As of the date when the client fails to fulfil any obligation towards Fladderak, all and any further claims of Fladderak against the client shall be immediately payable. Incase of a jointly given client assignment,the clients, if and insofar as the work has been carried out for the benefit of the joint clients, shall each be jointly and severally liable towards Fladderak for payment of the entire invoiced amount, all interest, and all expenses. Fladderak has a lien overall goods of the client in the possession of Fladderak today or in the future, and for all claims that Fladderak has or could have on the client. Fladderak shall carry out the client assignment to the best of its ability. It shall observe the due care that is fair to expect. Fladderak has the right,without notifying the client, to outsource the work to third parties to be appointed by Fladderak,being subcontractors or otherwise. Fladderak shall warrant for such third parties in the same way as for its own staff. Should the aforementioned staff and subcontractors be held accountable by (the client or)third parties outside the agreement for the work for which they were engaged by Fladderak, they can rely on all clauses pertaining to exclusion or limitation of liability contained in the present terms and conditions. If during the client assignment work has been carried out for the benefit of the client outside the agreed scope of work, the assumption shall be derived from the relevant notes in the recordsof Fladderak and/or the its associated natural persons and/or legal entities that such work has been carried out by virtue of an occasional client assignment on the part of the client, without prejudice to the right of Fladderak to provide such evidence with other means. Fladderak is authorized to suspension of all of its obligations,until the moment when all due and payable claims,including but not limited to advance payments,have been fully paid by the client. The client has no right to rely on suspension of performance. Fladderak does not accept liability for any damage on the part of the client caused by the delayed handling of work because of the suspension. Client complaints referring to patent defects in goods upon delivery must be reported in writing by the client to Fladderak within 8 days after delivery (or within 8 days after the invoice date if there is no delivery). Defects that were not patent at the time of delivery must be reported in writing by the client to Fladderak within 8 days after the defect became visible, it being understood that the client must prove that it could not reasonably establish the defect sooner,and that in addition the complaints do not refer to work carried out by third parties or goods delivered by third parties. Taking action on complaints by Fladderak shall not qualify as acceptance of liability howsoever. If the complaints of the client are deemed well-founded, and unless mandatory legal provisions prescribe otherwise,Fladderak shall exclusively undertake to performance of the agreement, or,at the discretion of Fladderak,to reimburse the price. c) the complaints are expressed for the first time after expiry of a period of more than 12 months since conclusion of the agreement. Fladderak shall never accept liability for any damage consisting of loss of profit or loss of revenues or any other indirect damage or consequential damage, such as damage caused by business interruption or environmental damage,or any damages or penalties payable by the client to third parties, unless such damage is caused by gross negligence or wilful intent on the part of Fladderak. Without prejudice to the provisions in paragraph 1,other damage than the damage referred to in such provisions shall be compensated up to the amount paid for such damage by the insurer(s)of Fladderak under the insurance policy/policies concerned. The liability of Fladderak shall in any event be limited at all times to the invoiced value of the goods exclusive of VAT, or at least that part of the client assignment that the liability refers to. If such invoiced value cannot be determined, the market value of the goods -to be demonstrated by the client-shall replace the invoiced value, this to be determined upon commencement of the liability period. The compensation referred to in paragraph 2 refers to all damage events combined resulting from the agreement concerned. The right to damages shall lapse 12 months after the client has become -or ought to have become -aware of the existence of any rights of legal action on the part of Fladderak. No guarantees shall be given by Fladderak, unless explicitly confirmed in writing. The client is held to make all data and documents, which in its opinion Fladderak needs for a correct performance of the client assignment,available to Fladderak well in time. Fladderak has the right to suspend performance of the client assignment until the moment when the client has fulfilled the obligations referred to in the previous paragraph. The client guarantees the accuracy of all data and documents that it has submitted. Fladderak does not accept liability for any damage caused by incorrect or incomplete information. Incase of force majeure,Fladderak shall be entitled to either keep the agreement intact with suspension of its obligations for the duration of the force majeure, or to dissolve the agreement due to unforeseen circumstances. The client may order Fladderak in writing to express its choice in this respect within 10days. In the event of force majeure the client cannot hold Fladderak liable for damages. Force majeure shall include all and any circumstances that are reasonably beyond the control of Fladderak or whose consequences Fladderak could not reasonably prevent, including but not limited to fire, theft from the warehouse or work stations of Fladderak, strike, bad weather conditions, machinebreakdown, shortage of components, bankruptcy of suppliers, stagnated supply, transport problems, as well as all and any other circumstances that are beyond the control ofFladderak. d) the client discontinues its business,or – if it refers to a legal entity or a corporation – is dissolved. The client shall waive the right to declare the agreement with Fladderak null and void or to dissolve it in whole or in part,or to arrange that the agreement shall be declared null and void, dissolved, or amended in whole or in part. Should any of the provisions in these general terms and conditions prove null and void or voidable in whole or in part, this shall not affect the validity of the other provisions. The provision that is null and void or voidable shall be replaced, by mutual agreement between the parties,by a binding provision that shall approximate the provision that is null and void or voidable as much as possible,as regards contents and scope. All offers, order confirmations,agreements,and any other legal relationships between Fladderak and the client are governed by Dutch law, with exclusion of the Vienna Sales Convention. All and any disputes between the client and Fladderak shall be exclusively brought before the competent court of law in Rotterdam, or before the local competent court of law in accordance with the applicable statutory rules, this at the discretion of Fladderak. These general terms and conditions are available in Dutch and in English. In case of any dispute regarding the interpretation of these terms and conditions, the Dutch version of the general terms and conditions shall prevail. Revision of these general terms and conditions by Fladderak cannot be excluded. The applicability of the Vienna Sales Convention is precluded by the parties. The delivery and performance deadlines stated by Fladderak cannot be regarded as final dates, unless agreed in writing.In case of late delivery Fladderak must therefore be held liable in writing, it being understood thatFladderak shall be allowed a reasonable period of time to deliver the goods after all. Expiry of the delivery deadline shall not compel Fladderak to pay any compensation, nor shall it entitle the client to dissolve the agreement. Fladderak and the client may declare Incoterms applicable to the agreement concluded between them,it being understood that in case of incompatibility these general terms and conditions shall prevail. Transfer of ownership of goods delivered by Fladderak shall be effected on the condition subsequent that the client has fully settled all claims of Fladderak regarding delivered or deliverable goods or regarding failure to perform on the part of the client, and inclusive of interest and expenses. Without the written consent of Fladderak the client is not entitled to encumber or alienate the goods delivered under retention of title, or to have these used by third parties. Incase of late payment of an amount that is due and payable, or if the client applies for or obtains an administration order,or is declared bankrupt, Fladderak shall be entitled,without requiring any notice of default and without any judicial intervention,to dissolve the agreement in whole or in part,and to claim the goods subject retention of title of Fladderak as its property, without prejudice to the right of Fladderak to claim damages. All warehousing agreements are governed by the Dutch warehousing conditions as filed by Fenex at the District Court of Rotterdam, latest edition, without prejudice to the provisions in article 4 (disputes), which includes an arbitration clause. 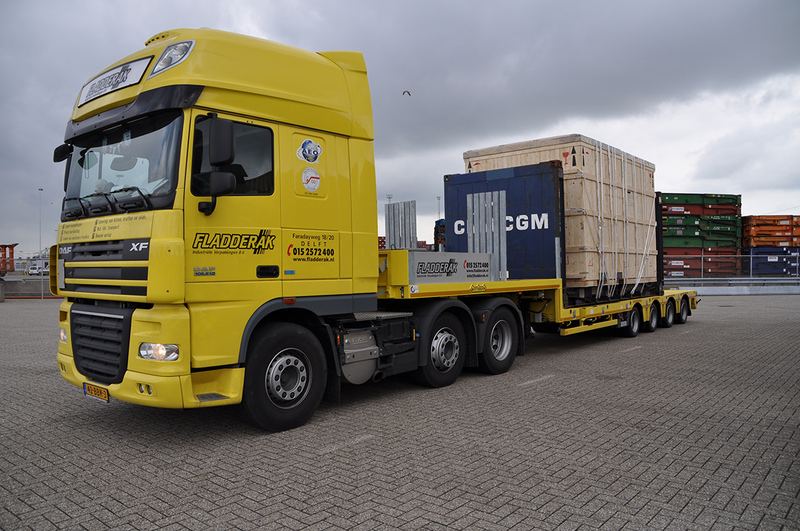 The client is held to provide Fladderak with the correct and full written description of the goods to be deposited, including but not limited to the value, number of package units, gross weight and furthermore all further particulars. Unless stated otherwise,all goods shall be delivered to Fladderak in good orderand,if packed, in proper packing order, for lack of which the client shall be liable for all and any resulting damage. Fladderak has free choice of the place of storage and is at all times authorized to relocate the goods to another storage location. Fladderak shall notify the client of the relocation. The client has the right,at its own expense and risk,to get access to the place where the goods are stored. Access can be given only during regular business hours and if accompanied byFladderak. The client must at all times comply with the locally applicable (safety) regulations as well as with all other (safety) regulations drawn up by Fladderak. Storage shall be at the expense and risk of the client. If the goods are destructed during the storage by fire, storm,or another cause that cannot be reasonably blamed on Fladderak, the client shall owe the agreed storage rate up to and including the day of destruction. The client may recall the goods against payment of any claims of Fladderak on the client pursuant to the agreement. If the client fails to fulfil its obligations under the agreement,or in the event of another circumstance as a result of which Fladderak cannot reasonably be expected to continue storing the goods for the client, the client shall be held to recall the goods immediately upon first request of Fladderak. The client is held to notify Fladderak immediately in writing of any transfer or transition of ownership of the goods, respectively transfer or transition of the right to deliver the goods. After the transfer or transition the client shall remain liable towards Fladderak for all and any claims of Fladderak by virtue of the agreement. If the new entitled party has accepted the provisions from the agreement and these general terms and conditions, it shall,in addition to the client, be jointly and severally liable for the claims of Fladderak by virtue of the agreement,also if and insofar asthese have arisen before the transfer or transition. Fladderak is a forwarder and shall only conclude transport agreements for the benefit and in the name of the client to execute the forwarding agreement. It can never be regarded towards the client as a transport company, without prejudice to article 5.1 paragraph 3 of these general terms and conditions. All forwarding agreements are governed by the Dutch forwarding terms and conditions as filed by Fenex at the District Court of Rotterdam, latest edition,without prejudice to the provisions in article23 (disputes), which includes an arbitration clause. Only if road transport has been explicitly agreed and if this is carried out by the own means of transport of Fladderak, there shall be no forwarding. In this case the transport agreement shall be governed by the GeneralTransport Terms and Conditions2002 (AVC), or at least the latest filed version since then, regardless of whether it refers to national or cross – border transport,in which case the aforementioned AVC terms and conditions shall be applicable, in addition to the provisions of the CMRTreaty. With due observance of the above,Fladderak shall take out an insurance for the transport at the expense of the client exclusively at the explicit request of the client.